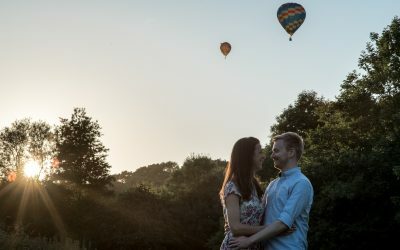 I have done a lot of engagement portrait sessions in Central Bath and felt a tad bored of them, so when Alex asked me where I suggest we do our shoot, I suggested beautiful Newton St Loe to her. This is a small village right on the door step of Bath, it has the world’s best farmshop, is beyond pretty and offers fantastic countryside views. It turned out to be an excellent choice because as a surprise Alex and Stefan brought their new puppy with them. Now they say never to work with kids or animals, but I’m sure you agree with me, this big eared bundle of energy is rather cute! Lydia and Andrew’s wedding at Clifton College in Bristol was special for a unique reason: Lydia is one of three siblings and I photographed all of their weddings! First Karis and Will’s wedding at Folly Farm in July 2014 and then Colette and Ed’s wedding at Aldwick Court Farm in April this year. So needless to say, I was excited to meet Lydia’s family for the third time and to photograph stunning Clifton College for the first time. Although it was mid-July the weather sadly didn’t cooperate, and the forecast was light rain – not ideal for an outdoor wedding ceremony! To my joy Andrew was undeterred though and proceeded with the plans for the outdoor ceremony. After a short site visit I headed over to the Marriott Hotel Bristol to capture the bride getting ready. Lizzy Westney did an amazing job getting the girls ready. Once Lydia was ready we both rushed back to Clifton College and the ceremony started immediately. Yes, it was windy and yes, it was raining a little, but this did not stop the lovebirds from having an amazing and emotional time. Never have I seen a couple skip back down the aisle together, you could see it was pure joy (and a little relief I guess). Thankfully the rain stopped, and everyone enjoyed the drinks reception outside, followed by the wedding breakfast inside the (grand hall). I think I have written about this before, my favourite part during weddings are the bride and groom portrait shoot and the speeches. The latter yet again didn’t disappoint with an enormous number of speakers: bride’s mum and dad, bride’s uncle, groom’s dad, bride and groom, and last but not least the best man! It felt fabulous to get a mention by the bride since it was third time lucky (see first paragraph). Ready for food, everyone enjoyed a few hours of socialising, followed by the first dance and joyful celebrations. And if you look carefully, you might even see me on one of the images! Thank you for making it to the end of this post. End of November I had the huge honour to take portraits of one week old baby James, my first rainbow baby. For those who don’t know, a rainbow baby is a baby born after the loss of a previous baby, either through miscarriage, stillbirth or infant death. James’s parents Katie and Adam tragically lost baby Olivia after 36 weeks of uncomplicated pregnancy and she was born asleep. Having photographed their wedding a couple of years prior, I was thrilled when Katie announced her pregnancy and booked me in for newborn portraits. When she told me about Olivia’s birth and death I was deeply moved and totally devastated. 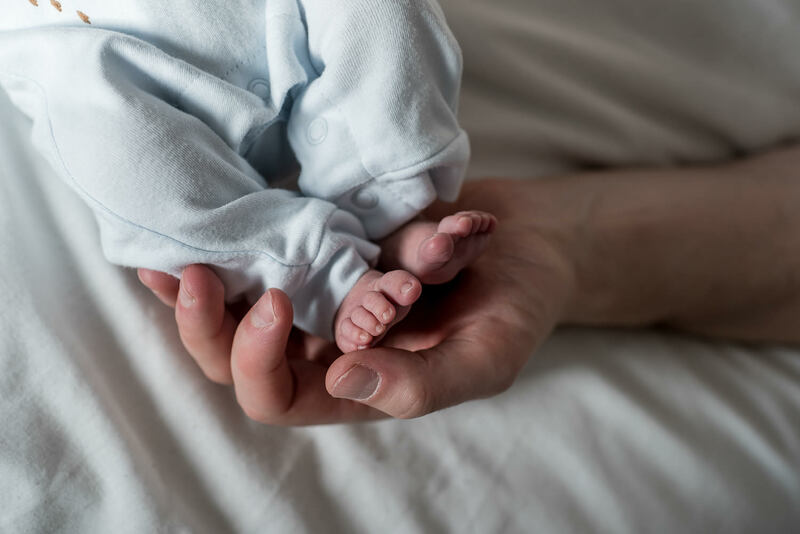 Having had two children myself I was familiar with the subject of the importance of monitoring the foetal movements and the worries associated with not feeling the baby. In Olivia’s case there were no warning signs, no hereditary issues and it happened very suddenly. Did you know that as many as 1 in 200 babies are born asleep in the UK? A terribly high number that makes my heart bleed. In the UK 1 in every 200 babies are stillborn. So you can imagine my joy when Katie sent me an email to say that they were expecting another baby and that in fact she was induced the very next day. Baby James was born without any complications and was completely healthy! Within a week I had the pleasure not only to photograph him, but also to hold him, give him a snuggle and even a bottle of milk! The portrait session took place in Katie and Adam’s home which is where I prefer to take newborn pictures as the parents simply feel most comfortable at home. The shoot was very emotional, we laughed and we cried (me on the way home when I was alone in the car). But it wasn’t only sad, it was also meaningful, celebrating life, showing what an amazing bond Katie and Adam have to have gone through this together. It shows that hope and love are stronger that despair and fear. The pain of Olivia’s death will never go away, but it has been made bearable by the birth of her brother. Or as Katie herself put it – she said that Olivia had selected a little sibling and sent him/her towards Katie & Adam. So while I go and wipe the tears from my face, I leave you to enjoy these precious pictures. You can and should never take the answer to this question for granted as there are various family circumstances that might change the answer to the question. Most brides answer with ‘Dad’, but some brides might not have a good contact with Dad so chose mum or Dad might no longer be around to walk his daughter down the aisle. This was the case at Ed & Colette’s wedding at Aldwick Court Farm last year. Sadly Dad had passed away after short illness when Colette was a teenager and her brother stepped up to walk her down the aisle. During the ceremony and shortly before Ed and COlette exchange vows and rings both mothers stepped forward to be with their children. Colette’s mum grabbed her hand and I saw the ‘Dad’ tattoo which made him very much part of the moment, the day and their wedding. 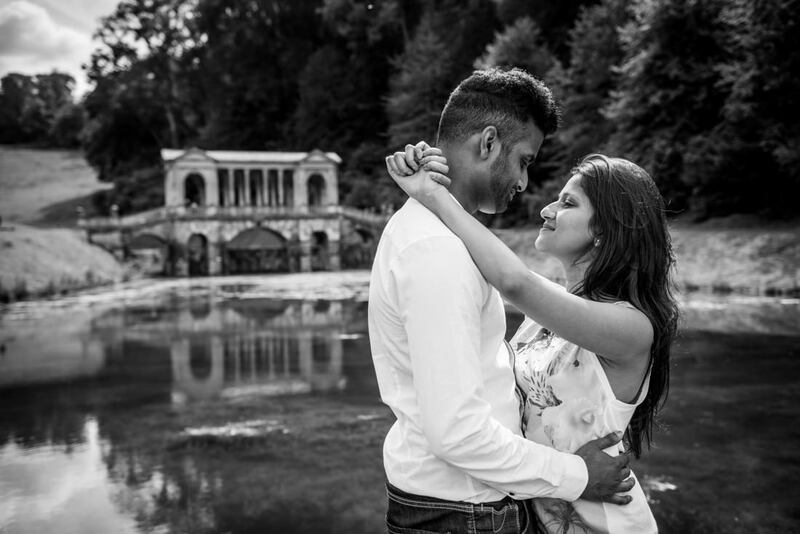 In the summer I had the pleasure of photographing a surprise engagement on the beautiful Palladian Bridge in Bath. 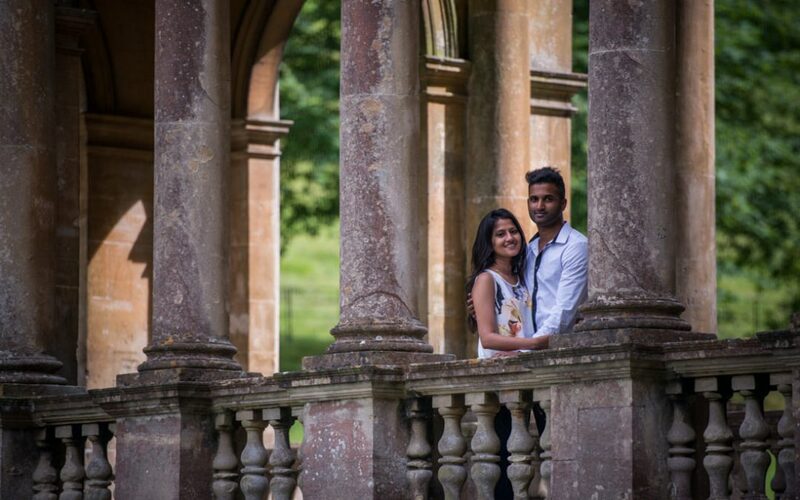 Shehan had contacted me a few weeks in advance to share his plans of proposing to his girlfriend on a day trip to Bath. They were lucky to have a beautiful sunny summer’s day. I got to Prior Park well before them to set up camp not far from the bridge, with my cameras ready and hidden under my rucksack. Once Shehan and Kumari finished their picnic, they started wandering towards the bridge and it all got very exciting. After a short while (of probably gathering his courage) Shehan fell down on one knee and held up his ring. They were too far away for me to hear them but not too far to catch them with my zoom lens. She said yes and there were hugs, kisses and tears. Then he turned around and pointed at me, which added to Kumari’s surprise. After a moment of calming down, we went for a walk together through the park and took some portraits of the newly engaged couple. 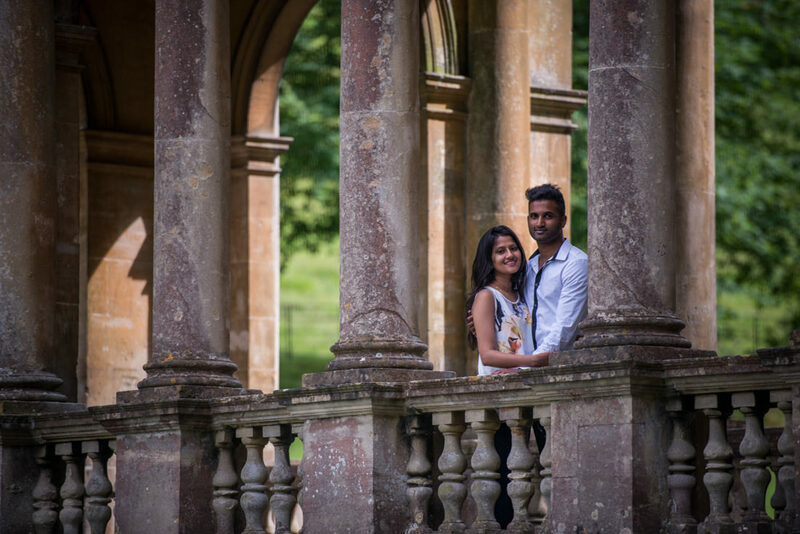 I have to say I have a lot of respect for Shehan to propose in front of my camera as I have no doubt this must have been an immense act of courage. But now they have the moment captured in pictures forever! 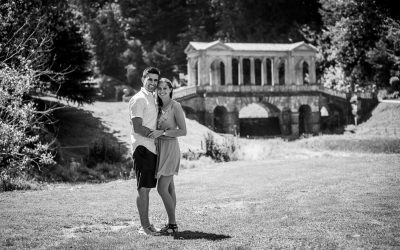 If you are planning a surprise engagement for your partner and would like to have the moment captured, please don’t hesitate to contact me – I can help you find the right location, plan the necessary details and help make it a memorable event!